This was the weather forecast for today. Not radically unusual for Melbourne but not what you want to see when you had planned to go for a run with several thousand runners, today being the annual ‘Run for the kids‘ held to raise funds for Melbourne’s Royal Children’s Hospital. Let me clarify – I’m not a fair weather runner. If anything, I’m more likely to stay home if the forecast is for hot weather but the idea of being caught in a thunderstorm on top of Bolte Bridge didn’t fill me with joy. I will be honest, blog reader – the thought of not going did enter my mind. And then, about half a second later, the thought evaporated. Of course I would run it. After all, humans are, luckily, waterproof and unlikely to be damaged by rain. So it was time to stop being a princess and get out there. The finish line. Only the minor issue of 14.6km to run to get there. The organisation for this event is epic and inspiring – they just get it right. Plenty of toilets for everyone. A bag storage area which runs like a well oiled machine and which was prepared for whatever the weather brought. Not to mention the friendliest volunteers you’re likely to find anywhere. Rugged up in their wet weather gear, they each managed to smile and seem completely unfazed by anything. After hanging out a little bit, I was lucky enough to bump into some friends so the last 1/2 hour before the start zoomed by and soon enough, we were heading down to our colour zones. I was in orange and they were yellow so we snapped some pics and headed off to our respective areas. While standing in the orange pen, surrounded by a lot of excitement and clearly a few nerves, I thought a lot about my first Run for the kids and how far I’d come since then. The rain had held off until this point but it started to lightly drizzle as we shuffled towards the start. No one complained nor did they even seem to notice. Everywhere you looked there were reminders that this run wasn’t about us, it was about the children who had been cared for at the Royal Children’s Hospital with many people sporting photos or names on their shirts of loved children they were running for. Running in the rain was nothing compared to the challenges some of these youngsters faced and that was very much in my mind as our wave headed off. 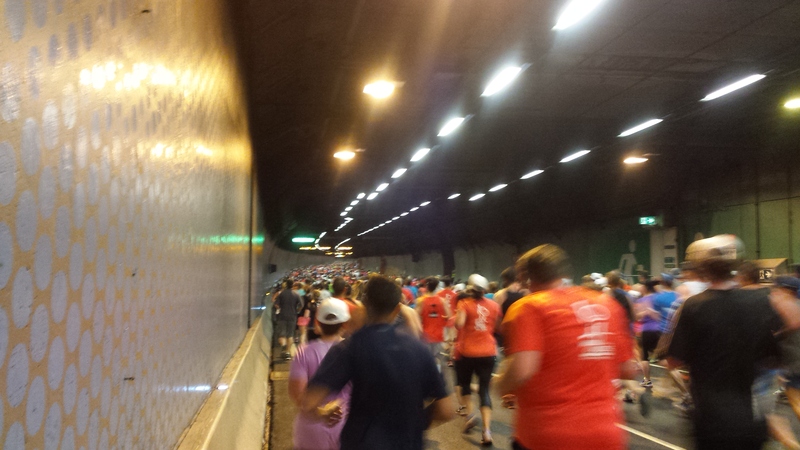 The run starts by heading over Swan St bridge and down towards the Domain tunnel and this is always a fun part. It’s vaguely downhill and everyone is in high spirits. Turning into the tunnel is a little tight but then everyone spreads out again when running through the tunnel. It’s both eerie and quite amazing – excited chatter and puffing and panting echo around and the stuffy atmosphere makes it feel a bit like you’ve been transported somewhere far away. It doesn’t last long as the gentle climb soon begins to deliver you back into the fresh air. Today, a light rain could clearly be seen to be falling at the mouth of the tunnel but I was glad of it – I was hot and in need of cooling down. The next section is running along the freeway – another strange experience as cars and trucks whizz by at either side and all the signs overhead remind you that you’re getting to run somewhere very different. The volunteers at the aid station just before the Bolte epitomised the spirit of volunteers on the course – so friendly, happy and helpful, regardless of being stuck out on a freeway in the rain for hours on end. I can’t speak highly enough of them. And so we began the climb onto the Bolte Bridge. The fact that, this year, I managed to run it is indicative of the training that has happened over the last 12 months. It wasn’t at all the obstacle I’d seen it as previously and I was soon at the top and took some time for the obligatory selfie opportunities. 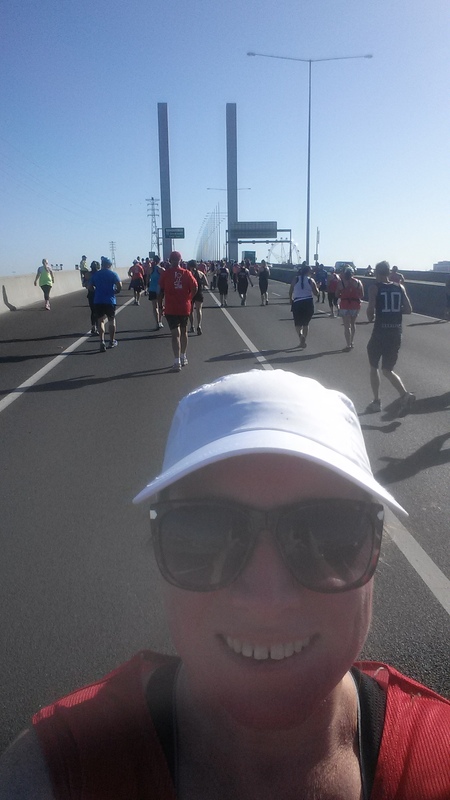 I made up for my selfie minutes by cruising down the other side of the Bolte, even briefly overtaking the inflatable tyrannosaurus I’d been following since the start. There were certainly some weird and wonderful costumes out there today. As well as the dinosaur, I saw a few superheroes and an elaborate minecraft costume plus the usual array of tutus. The rain didn’t appear to be holding anyone back and the atmosphere was as fun as ever. The next section was running through the Docklands before tackling Collins Street hill – my least favourite part of the course. I ran/walked it but with a lot less effort than I had to expend previously. In fact, 11km in, I was still feeling great with nothing hurting and I felt like I could keep up the pace for the remainder. It also certainly helped to have pictures of children treated at the hospital on each of the kilometre markers – an important and poignant reminder of why we were running. The run along Southbank is always a highlight as the central area is reserved for runners with Sunday morning breakfast diners and pedestrians watching and cheering from the sidelines. By now, the puddles were getting a bit bigger, my shoes were well and truly wet and I couldn’t really feel my feet but I was still having fun. We turned up towards St Kilda Road, along the road and then, almost too soon, the finish line appeared. I wasn’t quite ready for it and almost wished it was a few kilometres longer. Almost 🙂 I knew I’d run well but was really, really pleased to see how well – 2nd best 10km time ever and a consistent pace much quicker than I’ve managed recently, maintained for nearly 15km. The grin I’d had all day got a little bigger. This photo was taken 8 years ago this week at my very first, out there in public running event – Run for the kids which takes place through the streets of Melbourne. And I thought that was a momentous enough anniversary to celebrate with a blog post. I had trained (sporadically), prepared (kind of) and was a bundle of nerves the night before the big run (all 5.7km of it). My training had consisted mostly of short runs on the treadmill in my garage as I was far too embarrassed to run in public. I wonder now what I was actually embarrassed about but I’m sure it was a fairly lengthy list – my body, my outfit, my lack of fitness, lack of technique. All of it. So I shuffled through some runs on the treadmill while watching dvds. I didn’t talk to anyone about running but hovered on the periphery when other people did. I was interested but didn’t want to seem too interested in case they asked me something I couldn’t answer or which made them figure out I wasn’t a real runner. I wasn’t sure what made you a real runner at that stage but I knew I wasn’t one. I don’t even remember what got me started on running in the first place. I’d lost a heap of weight (through changing my eating habits – exercise had always been a bit of a swear word for me) and I think I just wondered whether the new, smaller me could run without making an idiot of herself. And then, to hold myself accountable to this crazy idea, I signed up for an event and even fundraised. 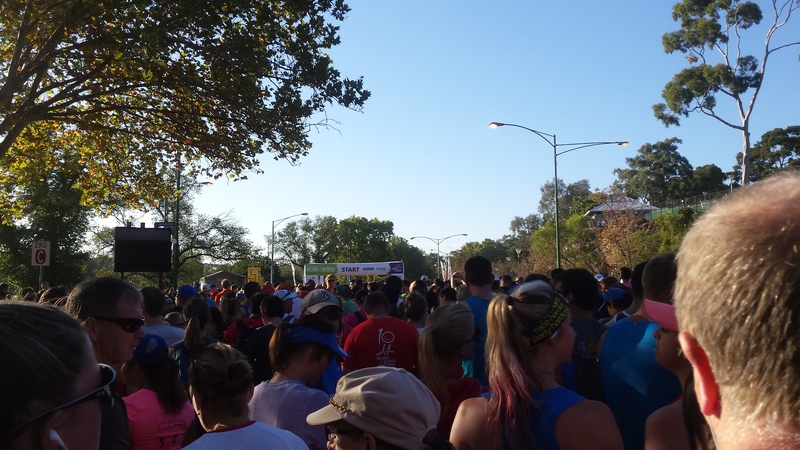 Nothing like the guilt of donations to make you drag yourself to the start line. Ah, the start line. I was ridiculously nervous and must have gone to the toilet at least 5 times as evidence. And I was emotional. I remember tearing up behind my sunglasses as they counted down to the start. I was so happy to be there, scared of what was to come, excited about it at the same time – just a potent combination of every emotion you can think of. And then we were off. I loved it, every step. I discovered, despite my nightmares which had indicated differently, that I wasn’t the largest, the slowest, the least fit, the one with the strangest running technique nor did anyone laugh at or ridicule me. In fact, I actually got some cheers and lots of support from runners and spectators. The smile in my picture was not for the cameras, it just leaked out of my face as I ran, a natural by-product of the day. I don’t remember many things from the run itself other than that it felt like it finished pretty quickly. I do remember running down the finish shute feeling deliriously happy and amazingly strong, like I could run another lap and still live to tell the tale. Since that first event, it’s certainly been an epic journey. While I kept running after that for a while, it didn’t become a habit and I gave it up for a year or 2. What brought me back to it was thinking about how I felt that day – how proud, how strong and how grateful to be able to do this. Since that day, I’ve finished many events (shall have to go and count them – I’m curious now!) but that first one will always hold very special memories. And that is why Run for the kids is an event I keep coming back to, regardless of how many times I’ve done it. It’s where the new version of me was born and for that I am eternally grateful. Run for the kids was my first ever public, out there for everyone to see ‘fun run’ so it does hold a special place in my heart. This morning, I ran the long course again – 16km of fabulous course, brilliant atmosphere and, most of all, dollars going to the Royal Children’s Hospital in Melbourne. It was an early start with my alarm going off at 4.45am and us leaving at 5.30am. The drive was kind and we arrived with heaps of time to wander down to Southbank for a toilet stop before heading over to the event village. It was already getting busy and the atmosphere was buzzing. We dropped off our bags, admired the sunrise and stopped off for another toilet stop before heading to our starting area. Selfies and group pictures done, it was very soon time to start. In fact, a bit too soon. Despite having been there a while, for some reason I wasn’t really ready and felt a bit rushed. Regardless, the start had happened; we crossed the line and headed over the Swan Street bridge and along the river towards the Domain tunnel. I absolutely love this part of the course – even though you’re quite crowded, everyone is happy and moving well and there is an undeniable buzz as you enter a tunnel that is normally the realm only of cars. A blurry vision of running through the tunnel – quite eerie. The gentle slope down into the tunnel is wonderful and I easily found a comfortable pace. Coming up the other side is equally as gentle but getting quite warm and stuffy which makes it more challenging. The breath of refreshing cool air as you exit is brilliant and makes up for the slightly steeper incline as you head along the freeway. By now, I’d dropped back from my friends as I knew I wouldn’t be able to keep up but didn’t feel at all lonely. I’m not sure if I started further ahead than last year or whether there were just more people but I felt like I had more company than in 2015. This was the point that the faster runners passed us, coming back in the other direction including 2 incredible wheelchair athletes. Soon enough, we were heading around the bend and up onto the Bolte Bridge. It’s not a terrible incline but it does seem to stretch on and on, particularly once you get to the base of the bridge itself. However it’s well worth it for the selfie opportunities at the top, made better this year by Nova’s selfie zone with willing volunteers ready to take your picture with the stunning backdrop. Photos done, I headed back down the other side and did my fastest stretch of the day, taking advantage of the lovely downhill slope to make up some time. We then turned back towards the Docklands and zigzagged along roads and between buildings before coming out at Victoria Harbour to another favourite spot, running along the boardwalk. Turning right, we headed along the back of Etihad stadium then onto Jim Stynes bridge which was quite fitting – it was just about this time that I was drawing on some of my mantras, one of which is being proud to run for those who can’t. Not a difficult mantra to say when you saw all the tribute t-shirts and signs around you, remembering children who were either taken too soon or having to endure all sorts of medical issues at far too young an age. Back onto the freeway and heading quickly towards the finish. Up to this point, the kilometres had absolutely flown and there were only about 4km to go. This probably felt like the longest stretch but was seriously not that bad. I was thinking in parkruns (less than 1 to go!) which helped and realising how far I’d already come certainly made it seem doable. As I headed off the freeway, there was a much needed hose being used as a temporary shower to run through at the drinks station and this gave me the boost I needed to keep going. We then snaked through the back streets of Southbank and under the Arts Centre before the final stretch along Alexandra Avenue. By this stage, I’d slowed to a walk (although a fairly fast one) and was saving energy until I saw the finish line – it still seemed a long way away! Turning right, the finish line was finally close and I headed steadily towards it, feeling incredible. + The course – You simply cannot get bored on this course and it really does make the distance fly. It is constantly changing and providing you with different scenery, as well as the excitement of running through a tunnel and over a bridge. Perfect! + Atmosphere – There is such a diverse mix of people at this event – serious speed demons, everyday runners, first timers, walkers, costume wearers – everyone! Added to that are those who are running in tribute to the little people who this event is all about – no wonder the atmosphere is so good. + Event fee – There is no medal at this event and I couldn’t be happier. The majority of your entry fee goes directly to the hospital through Good Friday Appeal and that is so much more important than adding to my bling. And, even with that, the event fee is very reasonable, encouraging more people to enter. + Event village – The event village has everything you could need – friendly volunteers at the bag drop (and an easy to follow, non-time consuming process), entertainment to divert you afterwards and delicious apples to start the refuelling process as you exit the finish chute. Yum. – No negatives. Seriously. It’s just a great event and I wouldn’t change a thing. Last year I commented on the start time, this year it was 7.45am which was perfect. I really wasn’t sure whether I’d make it to the start line this morning as I’ve had a cold and been feeling pretty rubbish for the past week. I’ve been resting up for the last few days but still wasn’t 100% when my alarm went off at 6am and got ready with a ‘I’m not sure if I should be doing this’ kind of feeling. I’m pleased to say that the excitement took over once I made it to the start area of Run for the kids and my sniffles were well and truly relegated to the back of my mind. It was a perfect, crisp, blue skyed Melbourne morning – gorgeous running weather. Despite all the people (the event attracted about 33,000 runners), it didn’t feel crazily crowded and, soon enough, the starting gun for our wave was going off and we began the shuffle forwards to make it across the start. I had my head down in concentration (and contemplation) when I heard someone say to me ‘Don’t look so serious – have a great run!’. Steve Moneghetti was standing at the start line cheering people on and these encouraging words instantly put a smile on my face and sent me off with enthusiasm. I had previously worried about the number of runners and had heard lots of people say how crowded it was at the start. However I didn’t feel boxed in at all felt the crowd were mostly moving together, with very few people attempting to weave in and out. We ran over the Swan St bridge and along the Yarra before turning sharply for our descent into the Domain tunnel. It was definitely an experience to get to run through here – warm and muggy but pretty spectacular. The hum of traffic was replaced by the hum of breathless runners and excited bits of conversation. Coming out of the tunnel brought cool relief – I hadn’t realised how warm it was in there until we were out in the fresh air again and it felt divine. Not far out of the tunnel, I came across my friend, Jill, from my local parkrun and was so pleased to be able to share much of the rest of the run with her. Running along the freeway then up on the Bolte Bridge wasn’t as challenging as I had imagined. I thought the hill was going to feel really steep but I don’t even remember it, just feeling really lucky to be getting to run over the bridge and see the views across the city and the bay. Clearly, I wasn’t the only one struck with the feeling as the majority of those around me stopped (or at least slowed down) for selfies and the volunteers on top of the bridge were kept busy with photo requests. Once we were off the bridge and weaving our way through the Docklands, I started to find things a bit tough, with the usual bits starting to hurt as they tend to do over longer distances. The hill up Collins Street was probably the most brutal on the course – it might be small but it’s also pretty steep and, having already run over 10km, my legs were feeling it. Soon after this, we were heading back over the Yarra and turning in to Southbank which was actually really good. The crowds eating brunch in the many restaurants and tourists out for a stroll added to the atmosphere and I felt really proud to be running in this event. And, with only a couple of kilometres to go, I knew I was going to make it. 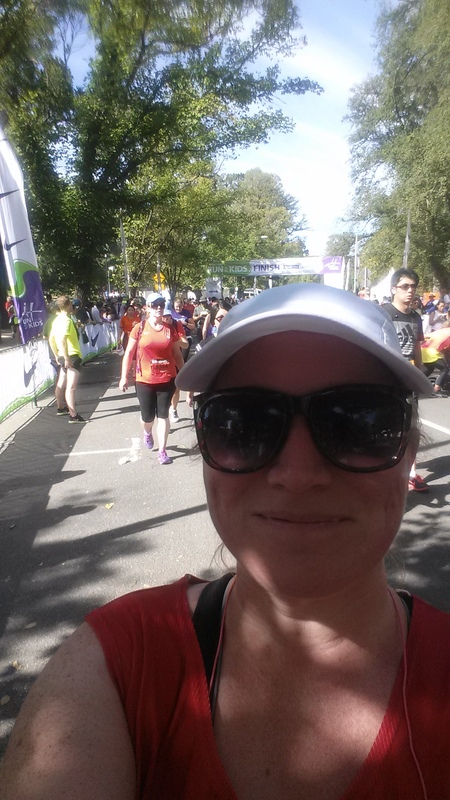 Heading back along St Kilda Road, I saw the finish line and had a renewed burst of energy – 15.5km done! Just over the finish line, I caught up with my friends and was so happy to be able to share this event with them. I usually run events like this alone and it really does make a difference to have someone to chat to afterwards and share in the experience. Summary: It was my 2nd time running this event – my first was my first ever fun run back in 2009 and I had just as much fun today as I did then. + Atmosphere: The event volunteers are so enthusiastic and supportive and the crowd is a perfect mix of serious runners, those out there for fun and those who are there to celebrate and raise funds for the amazing work of Melbourne’s Royal Children’s Hospital. That mix really makes for an incredible atmosphere. + The course: There is no other event in Melbourne’s calendar where you get to go through a tunnel and over a bridge so it’s definitely a winner from that perspective. Add into that the other fabulous sights of Melbourne that the course winds through – it’s the perfect snapshot of inner city life. + Entry fees: The entry fee for this event is a very reasonable $53, of which $31.60 is donated to the Royal Children’s Hospital. So as well as being a great run, you’re doing something worthwhile for others as well.